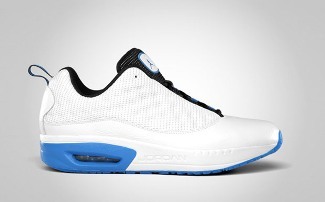 The first of the two editions of the Jordan CMFT Viz Air 13 will now be available in the market starting today. The new edition of this elegant low-cut show will be released in White/Italy Blue-Black colourway – a colourway inspired probably by Michael Jordan’s North Carolina connection. Featuring a white leather upper part and a black tongue, not only boast it’s performance-based qualities, but also its impressive clean look, which also features Italy blue outsole, heel, and the logo at the tongue. And because of its impressive design, don’t be surprised if this shoe will be a huge hit this month!